A good landing page has several elements to it, and as a marketer, you need to have an understanding of what your visitors want to see on that page. You’ll want to make it as easy as possible for them to submit their information to you, and recognise the benefits of signing up for your service or product. We created the Landing Page Design Template to help guide you through creating your next landing page, and the rest of this post will take a look at the template more closely. The template has been downloaded tens of thousands of times as a part of our 33 Web Marketing Templates – if you don’t have a copy you can download it below. 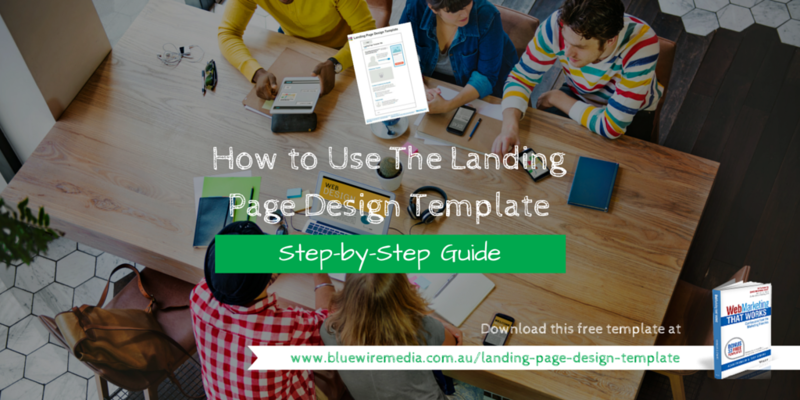 Bonus: Download the “Landing Page Design Template“. This template follows landing page design best practice to convert more visitors into leads. Use it as inspiration and adjust as you see fit. At the top of the page, you’ll want your company logo, and the title of the landing page. You can include any taglines for the landing page here as well. What you DON’T want to see at the top of this page is a navigation bar. That’s because this is a landing page – where people land (and where you want them to take action). So you don’t want to give them the option of leaving the page. They can always click the back button on their browser if they really want to leave. Your headline here should explain, in the most concise way possible, what the landing page is for and what you are offering your visitors. This is also a great place for a really strong testimonial – you should be sure to include the picture of whoever the testimonial is from. The testimonial should show off how your customers have benefited from your product, service or the resource you are offering them on this page. This helps to establish trust with your visitors and leads, and should encourage them to take action. Use directional cues such as arrows or people facing in the same direction, to point visitors to the form and call to action on the page. The call to action (CTA) and form on your landing page should be the easiest and most understandable part of your page. Think about the different links and buttons that you’ve clicked on recently – it’s likely that the copy and instructions were simple to follow, and there was something appealing enough for you to fill out your information and submit a form. You want visitors to understand exactly what they’re getting when they sign up and how they’ll benefit. A good example of a good CTA is from Dropbox. Immediately we get an understanding of what Dropbox is about, and what happens when we sign up. The CTA and form are easy to find and very easy to fill out. Next, give your visitors an example of exactly what they’ll receive when they complete your form. This helps to mitigate any sort of risk that they might associate with giving someone their information. Include a preview of the content – this can be a video or screenshot, even a Slideshare of the download that you’re offering. Take the opportunity to describe the benefits of the content and outline its features. This page on the UC Davis site is a great example – there’s a preview video, and the copy alongside the form helps to further demonstrate what you’ll get in exchange for submitting your information. Take the opportunity to include more quotes and testimonials from customers and fans. This is a great way to brag about your product, without actually bragging! The testimonials section at the bottom of this landing page from WebDAM works very well. There are a few well known brands that use their product, and including quotes and profiles from real clients helps build trust and connect with your visitors. Having an effective and straightforward landing page might take some effort to set up, but once you’ve got yours complete, you’ll be able to start testing what converts those visitors into leads and customers. Once your page is live, give it some time to start producing results. If you’re not seeing the kind of traction that you want, test little changes on the page to see if you get better responses – change the colour of the CTA button, or remove fields from your form to see if that helps gather the information that you actually need. Test these changes separately, however, so that you’re able to research what’s specifically working on the page and what you should remove. What kind of results have you seen from your landing pages? How have you been able to measure success?